Posted on 04/15/2019 by Mark Engleson	in Live Review and tagged folk, Pennsylvania, Philadelphia, Strand of Oaks, U Street Music Hall. Next, they played “Radio Kids” from 2017’s Hard Love. After “Radio Kids,” Tim said “I want to welcome everyone here to Eraserland. This is a family. A lot of people helped me get here.” In saying this, Tim alluded in particular to the assistance he’d had from most of My Morning Jacket in recording Eraserland. Disappointed with the reception for Hard Love, Tim had hit a roadblock in his writing. Carl Broemel, guitarist for My Morning Jacket, lured him back to the studio, which he booked with three other members the band. Motivated by his friends, Tim started writing again in the studio. 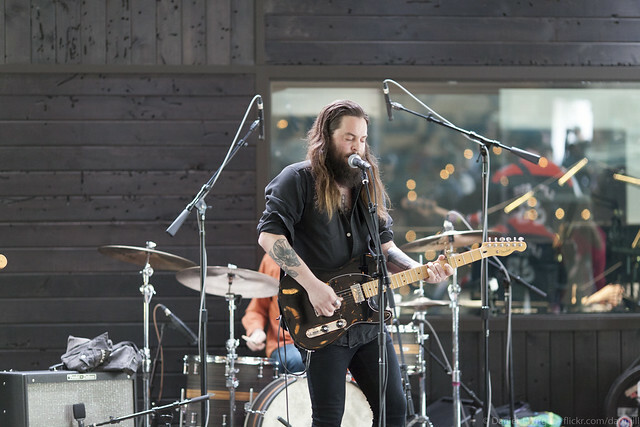 In addition to “Weird Ways,” Strand of Oaks played several more songs from Eraserland. After “Keys,” Tim told the audience that his tattoo artist was in attendance. He explained that his favorite tattoo, on his hand, was done in the Netherlands. Strand of Oaks experienced a career breakthrough with fourth album HEAL, released in 2014. Tim had already recorded the songs for HEAL when he was driving back to Philadelphia (where he lives) from Indiana (where he’s from) on Christmas Day, 2013. His car hit a patch of ice and spun out of control, crashing into two semi trucks. Tim broke every rib on his right side and got a concussion. This near-death experience influenced his mixing sessions with Grammy-winning producer John Congleton, leading to an album that hold a score of 83 on Metacritic and made many best of the best-of-the-year lists. Strand of Oaks had limited time for their set; Tim informed the audience that they had clear out for disco night. They only played one song from HEAL — “JM,” which stands for “Jason Molina.” Jason, one of my fellow Oberlin alumni, led the bands Songs: Ohia and Magnolia Electric Co., and passed away in 2013 from organ failure due to alcoholism. You should catch Strand of Oaks for a fully meaningful and entertaining show on this tour. You won’t regret it.